BookBrowse interviews Jeff Kamin runs the Minneapolis based Books & Bars book club which regularly attracts over 90 people to a meeting... about all aspects of their book club. 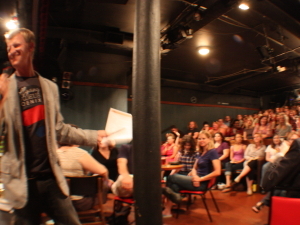 Former improv comedian Jeff Kamin runs the Minneapolis based Books & Bars book club. With over 90 people at a meeting about 40% of whom are men, Books & Bars is definitely "not your mother's book club". In this extensive interview Jeff discusses his club, invites authors to come and visit, and talks about his hopes to expand countrywide! Books & Bars book club was started by a now defunct St. Paul independent bookstore. I was asked to help moderate the discussions and select the books then took over running the club soon afterward. February 2011 is our 7th anniversary and will be our 90th book. We meet twice a month November through April on the 2nd and 4th Tuesday and once a month on the 2nd Tuesday May through October. 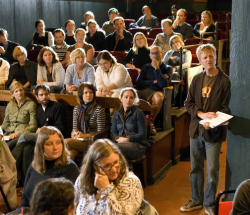 We've filling Bryant Lake Bowl Cabaret Theater and Aster Café to capacity with 90-100 attendees each show. We're about as diverse as Minneapolis is with many 20-30 something singles; married with children 30-40 somethings; and some more mature, perhaps wiser guests to round out our crew. Aster Café will be our main location moving forward in 2011. I come prepared with research notes and questions. We socialize, eat and drink for the first hour while I DJ, playing songs inspired by the book and the season. I do an introduction on the cordless microphone and then members raise their hands if they want to speak. We go wherever the audience wants to go, often following the spark of interest. Of the 90-100 people in attendance, usually at least 75 have read the book completely. Plot spoilers be damned. When you enter our show, anything about the book can and will be discussed. Everyone agrees that if they don't like the book before the show, they have a new perspective and better appreciation for it by the end of our in depth and entertaining discussion. If we are video chatting with an author via Skype, we hook a laptop into the theater sound system and project the video feed of the author on to a big movie screen on the stage. We ask authors questions directly by passing around the cordless mic. It's tons of fun and very informative. I'm trying to encourage more authors to make Minneapolis a regular stop on their tours. We are after all, consistently voted one of the most literate cities in the country. So, authors, please come to Books & Bars! Between meetings, I write our website content (with help on the technical side from a webmaster), writer our newsletter (1,000 subscribers) run our Facebook fan page (over 1,000 fans), and our Twitter account (600+ followers). I keep everyone updated and in the loop about upcoming events. I moderate our discussion forum and we vote on upcoming book picks, but as the members say it's "what (el) Jefe makes us read". I see that you ask ever so gently for tips, do you find that people understand the value of what you offer and tip you? Lately it's been getting better. Our indie bookseller/sponsor, Magers & Quinn, pays me a small freelance fee to run the book club and the Aster Café sees the value of our business model for them. Last night's tips for me were better than usual. For some reason, it's the new attendees that seem to tip better. So I keep looking to bring in new people, obviously! ;) It's a lot of work, yes. And from Day One I've treated it like a part-time job even before it paid anything. I have been offered other publicity and promotions gigs because of Books & Bars. I've been helping authors promote their work and scheduling readers and events around town for the library and others. 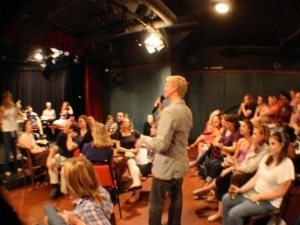 You were once an improv comedian; in what ways do you find improv useful at your book clubs? Improv is key to me. It's all about going off the last thing said. I'm listening and reacting. We're building this show together brick by brick. I "yes, and" by acknowledging the audience member's comment and then looking to add to it or find the person who has another related issue or point. Plus, I have to keep it fast and light and entertaining. Many people come just for the social fun and the laughs. They listen but don't want to contribute their own comments, which is totally acceptable, too. I see you've just expanded to two locations/meetings per month. Do you have any plans to expand further? Do you find the mood of the different locations is different? We were twice a month last winter, because, well, it's Minnesnowta. What else can we do, better read than just watch your whole Netflix queue, right? I love that 100 people get together to discuss a BOOK, not a reality TV show. We're changing watercooler talk. We're reinventing the book club. Twice a month will be our Nov-Apr model and once a month May-Oct, hopefully taking the show outside to the patio overlooking the Mississippi River and downtown Minneapolis at the Aster Café. We have not repeated an author yet, and don't intend to as that is our one unbreakable rule. Book selections need to be available in paperback, discussion worthy, readable in a month or two weeks depending, not Oprah picks, and mostly fairly recent literary fiction with a couple non-fiction, classics and YA choices each year. I usually plan ahead a few months to set our print advertising copy with our media sponsor, Metro Magazine. But I look at the whole year when plotting our course based on paperback release dates of books I know I want to cover for the club. What are some of the books that have generated the most interesting discussions? Some of our most interesting discussions and favorite books were Kafka on the Shore by Haruki Murakami, The Sparrow by Mary Doria Russell, The Raw Shark Texts by Steven Hall, The Omnivore's Dilemma by Michael Pollan, The History of Love by Nicole Krauss, The Brief Wondrous Life of Oscar Wao by Junot Diaz, Geek Love by Katherine Dunn, Zeroville by Steve Erickson, and Special Topics in Calamity Physics by Marisha Pessl to name just a few of the almost 90 books we've discussed. Usually some disagreement helps to better the discussion, though. Universally loved books are not always the best to debate. Sometimes I regret a non-fiction choice if the topic is too narrow or not of enough interest to the group. I have to consider the fact that 75 will buy, another 25 will borrow or get from the library and then there are numbers of people reading along at home who eventually tell me when they show up or send a mail. The Dispossessed by Ursula K. LeGuin was not too well received, but it was a worthwhile read to discuss. Fortunately my track record is good for the amount of time I consider each choice. I try to read along with everyone so we're in the same boat. It's not Jefe's faves, necessarily, as that would make a different type of club. It's based on reviews, the zeitgeist, shining a light on lesser known authors, and trying to keep a good balance of time of year and past reads, etc. Here's what's on our schedule: 1/25/11 – The Likeness by Tana French, 2/8/11 – The Adderall Diaries by Stephen Elliott (live video chat), 2/22/11 – One Day by David Nicholls, 3/8/11 – Carter Beats the Devil by Glen David Gold. Have the types of books you've read changed over time? Yes, I am happy to say we've added graphic novels as an option. I hope to do at least one a year. We don't do the standard book club fare. We're not your mother's book club. There were a few "chick lit" titles picked before I had full control. If anything, we may read too many male authors lately. Always looking for balance between men and women, fiction, non-fiction, classics, YA, graphic novels. I take pride in our 35-40% male membership, a rarity among book clubs. It looks like a huge undertaking - what keeps you doing it? Passion. It takes the love of new friends, an audience's laughter, the love of literature and the possibility of future business growth. Do you have a day job on top of all this? I do PR for movie studios part time and other publicity and freelance writing gigs. I am working on producing other shows and I'm also a hobby filmmaker and DJ under the Mustache Robots department of my home office. Who or what are the Mustache Robots? I wish I knew exactly. I just know they were coming to get my young boys one day and they screamed, "The Mustache Robots are coming to get us!" They became the enemies of the Knights of the Bright Side, which are Pablo, Doodles and yours truly, El Jefe. But maybe a mustache robot is a person who shows a little creative flair in our techno world? Mustache Robots can be found battling Knights of the Bright Side at mustacherobots.tumblr.com. So, in addition to your day job, you're a dad, maintain a website with forum and blog, and a presence on Facebook and Twitter - how do you manage it all! Coffee, wine, beer, fun…staying organized helps. Any advice for others who might want to do something similar? I have been approached by people in other states to start their own Books & Bars' franchise. I've actually trademarked Books & Bars and am hoping to set up a program I can offer to help new clubs get started. The main factor is finding the right person to keep it running after I set it up with them. The other option I am looking into is more of a countrywide video application of the Books & Bars model in which we meet via interweb town square of a sort. If anyone is interested in working on this with Books & Bars, please feel free to contact me. Thank you Jeff, you've given us a lot to think about - wishing you every success for many more years of discussion. Jeff was interviewed by Davina Morgan-Witts, BookBrowse editor, January 2011.